HONG KONG—On the evening of July 19, 2008, 200 Falun Gong practitioners held a candlelight vigil behind Beijing’s Liaison Office in Hong Kong. A suspicious man, who has been present at every Falun Gong activity in Hong Kong, was identified as a communist spy and quickly ran away. 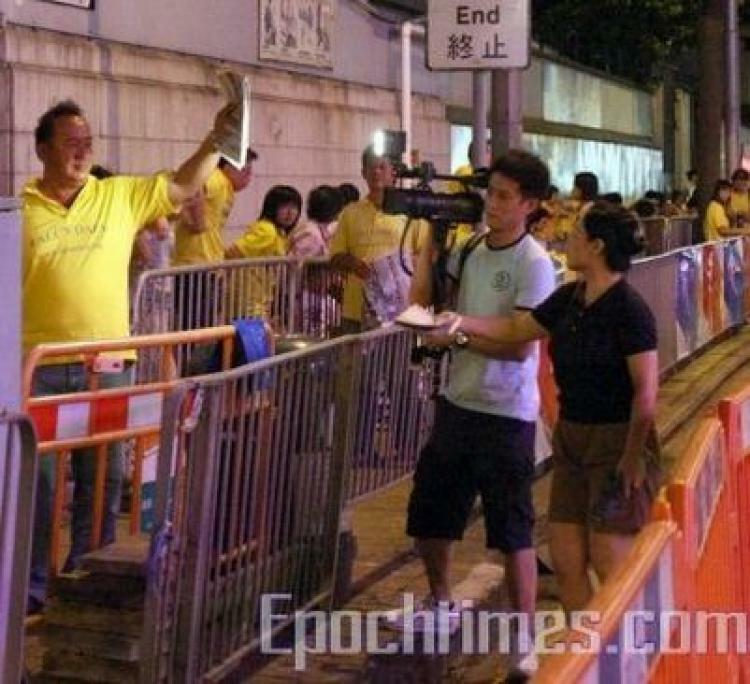 The man, wearing a gray-blue T-shirt with a video camera in his left hand and a camera in his right hand, took close-up shots of every practitioner present at the activity, and acted arrogantly when Falun Gong practitioners went up to him and told him to stop. He even insisted he was free to take photos and said, “Did you see me take any money? Why are you afraid of people taking your pictures?” Practitioner Zhu Keming told him not to sell his soul to help the CCP persecute Falun Gong practitioners for money. Zhu is the first person who filed a lawsuit against former Chinese leader Jiang Zemin for initiating the persecution of Falun Gong in 1999. At that moment, a female Falun Gong practitioner said, “I know who you are. You work at the Luohu Custom in Shenzhen. You last name is Chen!” The man found this practitioner in the crowd and yelled, “Who are you? How do you know me?” The Epoch Times reporter approached the female practitioner to ask for more details. The man quickly fled the scene. The female practitioner told the reporter the man’s last name was Chen and he had once detained a Hong Kong practitioner at the Luohu Custom office for two days. During that time, Chen interrogated the practitioner and threatened him to become a special agent to spy on other Falun Gong practitioners. Chen offered to pay this practitioner 20,000 yuan per month to collect phone numbers and contact information of practitioners in Hong Kong. After this practitioner returned to Hong Kong, he received phone calls from Chen every day, threatening him until he changed his cell phone number. In recent years, there have often been suspicious people holding video cameras, filming participants in many large-scale rights activities, such as the Quitting the Chinese Communist Party March and Hong Kong’s Annual March on July 1.